The dish we paired with The Fighter was meant to be raw and bloody ~ though the ‘blood’ came from a vibrant beet tartar whose magnificent color was spiked with a bit of vinegar. It was topped with a moussaline of whipped crème fraîche, a dollop of caviar, and a wreath of baby sunchoke chips. 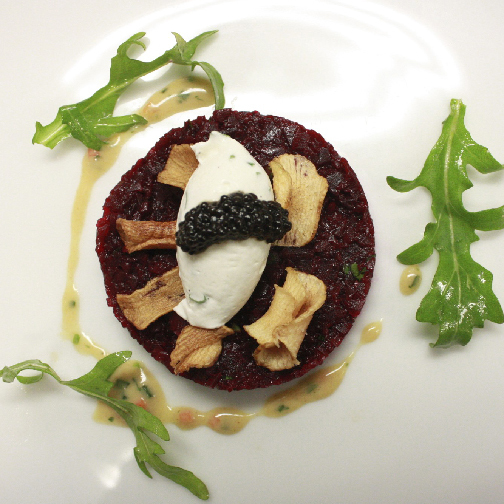 Texturally, while the beets and sunchoke chips initially tasted very different, the earthy flavor profiles of both root vegetables played in concert when paired with the creamy moussaline and salty caviar. The idea behind serving a spare green salad to honor a movie about starving ballerinas started as a joke. Then Chef saw Black Swan and was actually incredible moved by Natalie Portman’s beauty and elegance. 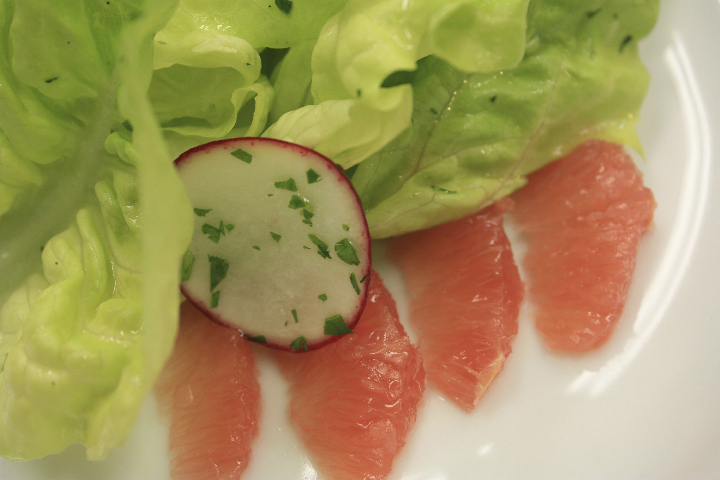 With it’s ruffle of butter lettuce, sharp crimson edge of radish, and delicate segments of ruby red grapefruit, the salad, finished with champagne vinaigrette and a shower of flowering rapini, was indeed a visual ballet of color and form. Delicious as well. Back in the day, when people still cooked on the hearth, small town bakeries were often used by villagers to cook their evening meal in the still warm wood fired ovens once the bread run was finished. There wasn’t a lot of heat left and space was always at a premium ~ but I’m guessing some wonderful rustic recipes came out of this unique and very communal way of cooking. 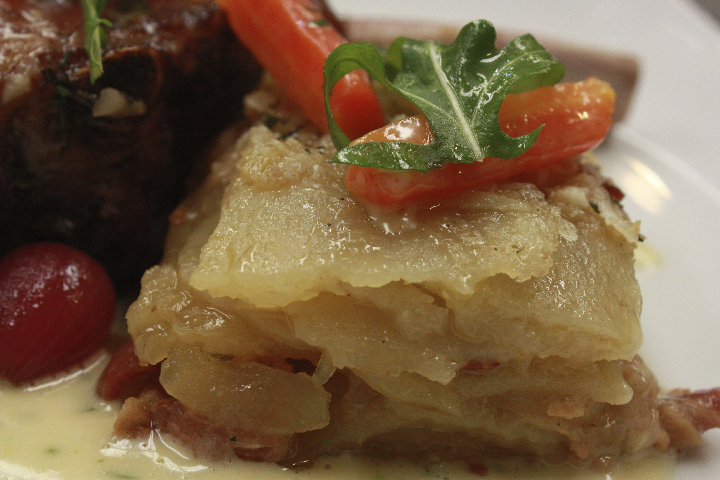 The story behind Boulangère potatoes was simple: meats were put on the top shelf with sliced potatoes beneath them, the better to catch the delicious meat drippings. Ryan’s homage to the dish couldn’t involve a bread oven. But if you took your eyes away from the screen on Oscar night and closed them, it was easy to taste the inspiration. His savory layer cake of thinly shaved potatoes was saturated in dark stock that dripped down flavoring the potatoes during the baking process. 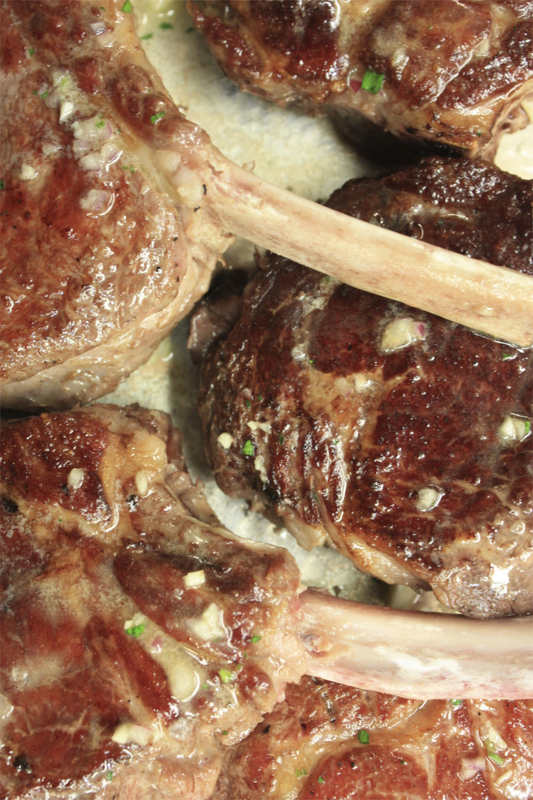 Served alongside big juicy veal chops from milk and grass-fed free range calves, this was haute campfire with True Grit. The veal was sourced from Sonoma Direct, where Ritz Guggiana and his cookbook-writing daughter Marissa (Primal Cuts) find some of the most delicious ethically sustainable animals in the county. Opps. While the Journal’s photographer clearly remembers devouring the Toy Story 3 Bon Bon course just as Best Picture was announced, images of it clearly did not make it into the camera. The plate was a riot of color ~ with sprinkles, roasted coconut and almond flakes covering dark, milk and white chocolate Bon Bons filled with passion fruit, vanilla and crème fraîche ice cream. 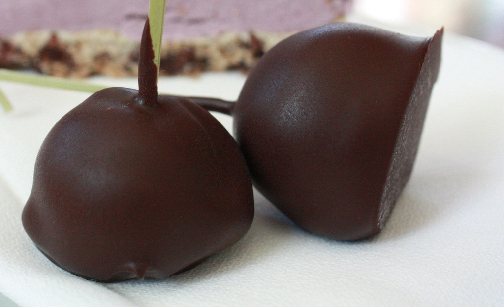 The good news is that the Bon Bons above are equally delicious and better yet, available often on our regular dessert menu. I was happily surprised we only received one complaint after last week’s admittedly bloody newsletter in which Chef Fancher dismembered a 90 lb Fritschen Vineyard’s lamb. ‘ugh, gross” the unsigned email read. Everyone around here figured a vegetarian or a vegan wrote it. But I’m not so sure. I know from personal experience it could just have easily been written by a passionate carnivore who loves to eat lamb. It is one of my favorites too, but if memory serves me, ‘ugh, gross’ was exactly the thought running through my head many years ago when I found myself face to face with a plate of Stuffed Lamb Heart. I was living in London at the time and it was my first outing to Fergus Henderson’s Mecca of Nose to Tail dining, St John. I fancied myself quite the food adventurer, but while I had devoured a plate of roasted bone marrow and parsley salad, bravely tasted deep fried lamb’s brains on toast and a spoonful of Gratin of Tripe, something about the sight of that heart made me realize what I was playing at wasn't a game. The non-stop plates coming out of this kitchen represented a whole new way of thinking about food, and that scared me. I can’t eat this I told my friends. In reply they didn’t argue or tease. One of them just leaned over the table and quietly asked, What do you have to lose? Nothing, as it turned out, and an enormous amount to gain. I no longer even remember what that dish tasted like, but the question has stayed with me. It proved especially providential six years ago when I began to start thinking about the kind of food we wanted to serve at Barndiva. So I’m sympathetic to the awkward part of any food journey, especially nose to tail, which certainly takes some getting used to. 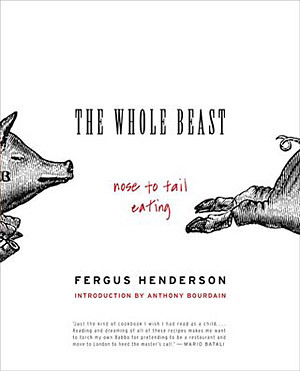 Anthony Bourdain was an inspired choice to write the introduction to Henderson’s cookbook, The Whole Beast, when it was finally published in America ~ we all know Bourdain is a guy who will eat anything. But while he was right to call the tome “a proclamation of the true glories of all the neglected bits of animals we love to eat,” for the rest of us he really should have written “neglected bits we should eat, but don’t.” Why we don’t is worth taking a look at. I grew up in the same era as my husband, but our exposure to food was vastly different. For a treat on Sunday he was more likely to be taken to the seaside for mussels, winkles and welks than a Baskin-Robbins for 31 Flavors of ice cream, which was invariably my family’s choice. Before I left home I never saw a cut of meat that didn’t come from the supermarket case. If it didn’t arrive in the house frozen, it quickly found it’s way there. I’m not dissing my mother, she loved the supermarket like every woman she knew at the time because its one-stop shopping experience meant a liberation of her time. Everywhere you looked in America during those years, if you bothered to look, you could have seen the effects of a ‘bigger is better, and cheaper is best’ mindset that was sweeping the country, ultimately having a profound effect on the survival of anything smaller and hand-made. I do remember thinking, when my favorite bookstore closed shortly after a discount book barn opened across the street, that the end result would be larger and larger venues with less and less choice when it came to books, but I never thought about how the same dumbing down process was profoundly affecting food. Never would have occurred to me. In the case of animal proteins the move towards corporate food production resulted in a cheaper unskilled work force hired to “butcher” animals for the money cuts, those parts of the animal that took the least amount of skill to extract. Anything that took time to cut or process was thrown away. 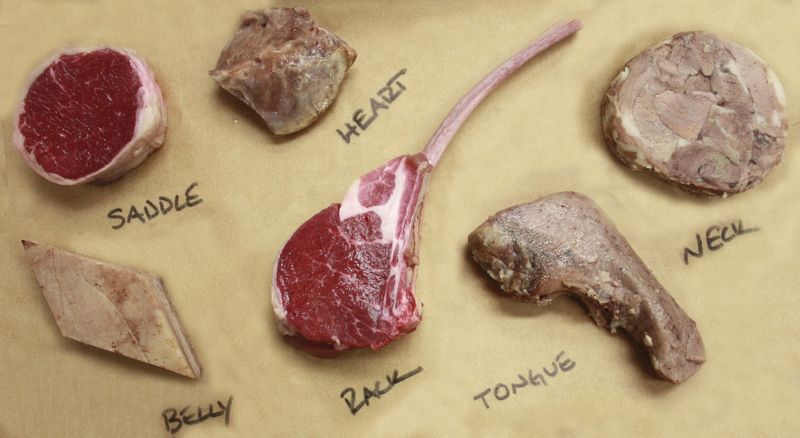 While we value cuts like filet mignon and rack of lamb for a variety of tasty reasons, we only started to think of them as ‘the best’ parts of an animal because that’s what the industry producing them wanted us to think. Offal was ‘awful’ and ‘cheap’ to boot, the implication being that if you ate tripe or had the wherewithal to make head cheese you were either a foreigner, lower class, or both. What nonsense. 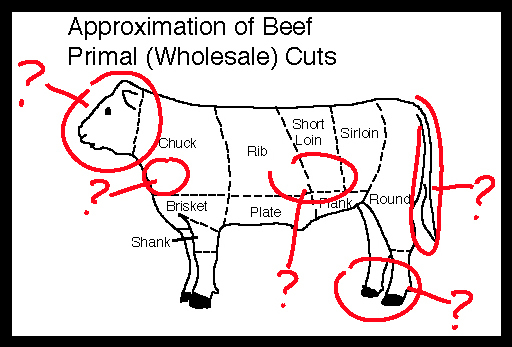 And it’s actually a misnomer to call the neck or the belly ‘cheaper’ cuts at all, when you factor the labor involved in properly butchering and prepping those parts of the animal. Real nose to tail cooking takes consummate skills that only start with the knife. Yet for a burgeoning middle class hanging over the freezer case in the supermarket during the second half of the 20th century, if the industry didn’t deem it salable it wasn’t to be easily found. As the butchers disappeared from the street, sub-primal cuts disappeared from the table, resulting in recipes which had been passed down for centuries becoming lost forever. Last week I made the point that there are profound environmental gains in shortening the distance between animal and plate, especially when it involves smaller, feedlot-free abattoirs that could service local farms and ranches. A return to this kind of food production would contribute to a more diverse marketplace, so much so it’s not a stretch to say that with accessibility to animals of this quality we could re-establish a system of food production that is infinitely healthier for us, and more humane to the animals we depend upon. All true, but we should fess up that here at Barndiva our main reasons for wanting to do more of this kind of cooking isn’t just politically or even morally driven. At the end of the day, the beauty of sustainability in this context derives from the fact that it’s also insanely delicious. 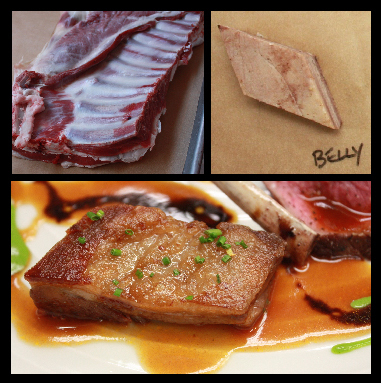 On Saturday night lucky diners in the barn were offered a $35 tasting menu with five different cuts of lamb from a single animal ~ belly, neck, leg, rack, and tongue. Each preparation drew from flavor profiles you just don’t get a chance to enjoy very often. Following this process over the past two weeks, from the day I met John Fritschen and photographed the lamb frolicking in his vineyards to the moment I lifted my fork to taste an incandescent morsel of Ryan’s rillette of lamb neck, I’ve thought a lot about how far we still have to go before we have anything approaching a true locavore economy. It’s quite a distance. On a personal level, however, I’m anything but disheartened. Every now and then I can see glimmers of it happening. I’ll tell you this, if the future could taste anything like the lamb my English husband and I ate on Saturday night, it’s worth working and fighting for. He and I had traveled vastly different roads to get to that moment together, which made the fact that we had exactly the same reaction to what we put in our mouths all the more remarkable: it was quite simply the best lamb either of us had ever tasted. 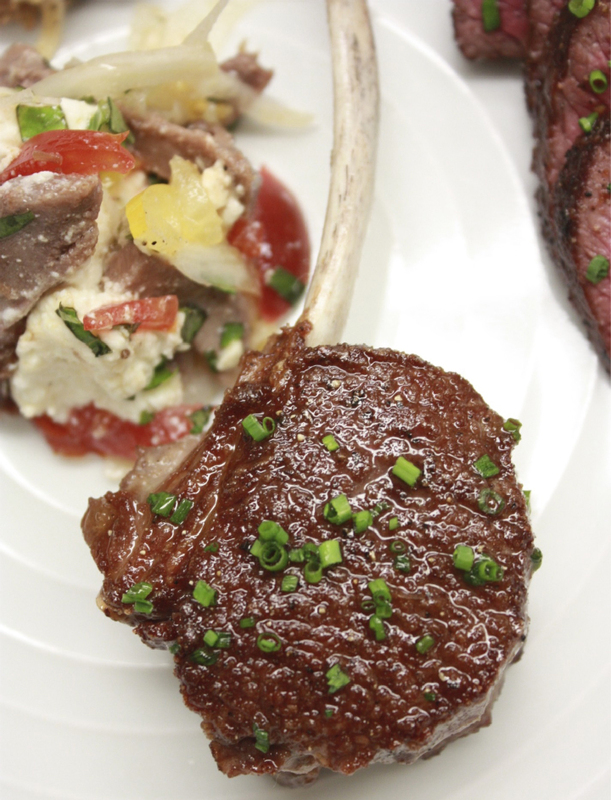 Here then are Chef Fancher’s notes on three of the five lamb dishes he prepared this week. 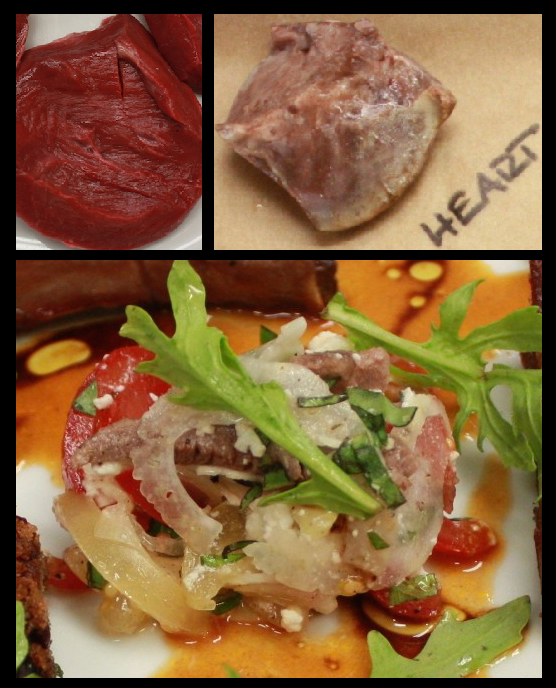 I’ve included a fourth, Lamb’s Heart, in part because it brings me full circle to that night in St John when I shared an exciting meal with great friends in noisy room at the edge of the Smithfield meat market. Though very few people got to taste Ryan’s Lamb’s heart, when all is said and done, it epitomizes what cooking nose to tail is all about. Cooking from the heart doesn’t get any better then this. Lamb Belly: Chef simmered the belly in a white wine stock with aromatic vegetables, then cooled and carefully cut out the bones and any remaining cartilage from the meat. He then seasoned the belly with salt and pepper and molded and pressed the meat overnight. This allowed the meat flavors to meld and gave him a piece he could cut multiples of any shape out of. He chose diamonds. 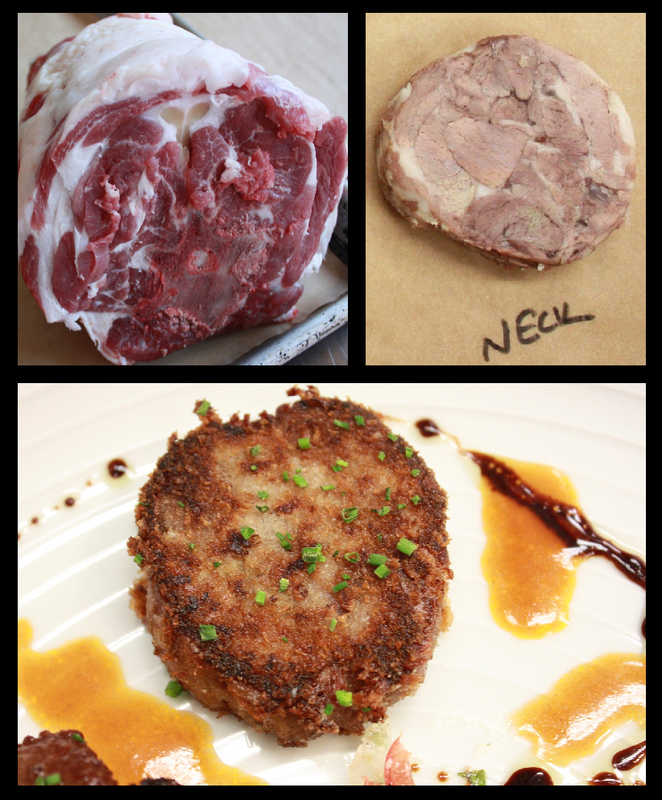 The product before the final cuts looks like a flatted chicken breast ~ Chef often calls this cut lamb’s breast. To cook he placed the fat side down in a very hot pan and did not flip the piece over at any time. If there is a secret to perfect belly it’s this: score the fat and let it crisp; the heat from searing the bottom will gently cook the meat on the top. Lamb Steaks (from the whole Leg) This preparation was a revelation for me. Who knew that the single leg I’ve just been roasting, bone in, all these years for Sunday lunch was actually five distinct primal cuts: sirloin, top round, bottom round, shank, and knuckle. Before working with them individually, he first marinated the whole leg in virgin olive oil, garlic, thyme, salt and pepper overnight, then pan roasted the leg until the meat began to relax from the bone. He was then able to separate it into the sub-primal segments, from which he cut the steaks. Lamb’s Heart A traditional preparation for heart is to mix it with giblets and serve it diced in the lamb jus, which is delicious. Ryan went another direction. He thinly sliced then gently grilled the muscle. When it was almost room temperature he tossed it with a tangy panzanella salad comprised of bread, feta, tomatoes and lashings of sherry vinegar. 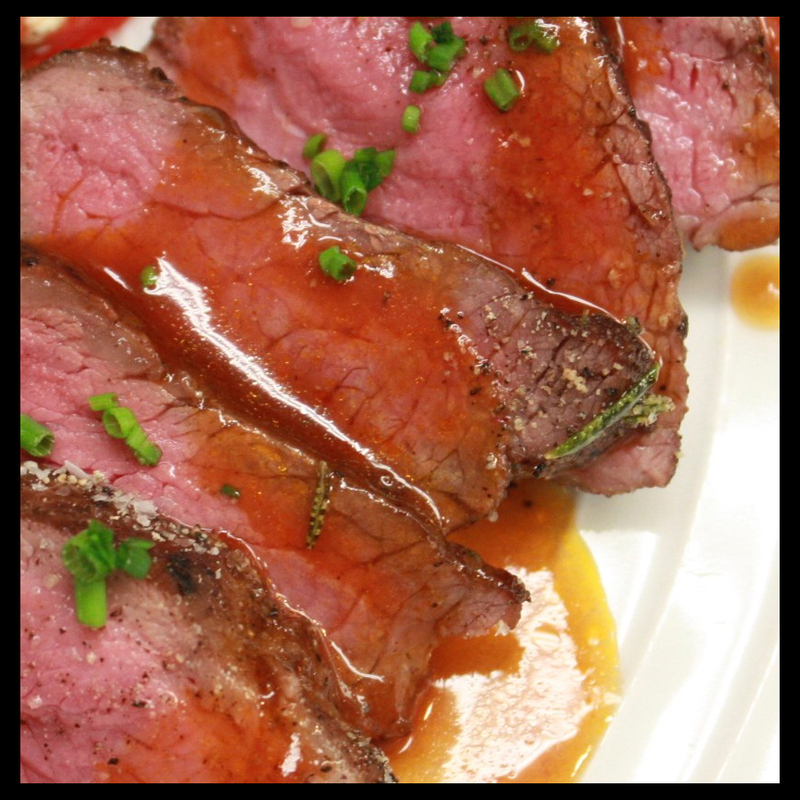 Chef’s words: “I like this preparation because with heart you are up against a predominate taste of iron…stands to reason…which is nicely cut by the sherry vinegar. There is no need for any oil in the salad, which is also a classic presentation for tongue. Our Friend Marissa Guggiana, whom we met in the early days of Fork & Shovel, is about to publish Primal Cuts, Cooking with America’s Best Butchers. A brilliant food activist and fourth generation meat purveyor, Primal Cuts, which will go on sale in October, promises to be sublime on all things meaty and wonderful. Check out her wonderful website. If you are a professional cook interested in where to source whole local animals that have been sustainably raised, contact her dad Ritz who now runs Sonoma Direct with her. If you are interested in a meat CSA, you might try The Sonoma Meat Buying Club.